Dr. Arevalo is board certified by the American Board of Internal Medicine. She earned her medical degree from the Universidad Nacional de Colombia. 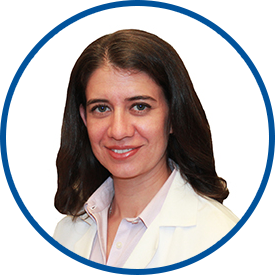 She then completed her internal medicine residency at Queens Hospital Center – Mount Sinai School of Medicine. Most recently, she was an internist with Maple Medical, LLP in White Plains for three years. Previously, she was an internist at Hudson River Health Care in Peekskill and at Cleburne Medical Clinic – Anniston Geriatrics in Alabama. Dr. Arevalo is affiliated with White Plains Hospital and Greenwich Hospital. Doctor Arevalo is a wonderful human being excelent Doctor, plus she explain everything in my language Spanish. I really appreciate you have Doctor Arevalo in your team. She is the best! *Dr. Arevalo is an excellent physician - caring, competent, ability to listen well, approachable - the list of adjectives goes on & on. Dr. Diana Arevalo-Valencia is one of the best doctors I have met. She is extremely knowledgeable, knows her subject thoroughly. Her insights in medications and Pharmacology is amazing - she knows what medicines to give and how it reacts with any other medication. Above all as a doctor she gives the care and understanding a patient needs. She explains, she listens and she acts. She is the BEST doctor WestMed has. Wish you would have more doctors like her. Kindly convey my thanks to her. There is no one like Dr. Arevalo. She is the best. She takes time with you. She listens to you, explains everything to you. Dr. Arevalo makes me feel very comfortable. She really makes it so that she shows a deep respect for me and for my health. She takes the time to get to know me and walks me through a plan to better my health. *Dr. Arevalo is the best. I won't see anyone else. First rate doctor. Interacts very effectively with me. I have all the faith in Dr. Arevalo. I followed her from her last practice on Maple Avenue in White Plains. She is excellent!!! Dr Arevalo was very thorough and kind.. I've never had a problem with my care provider. I'm very pleased with my care provider. She is the best.